Small whippet kennel in Umbria, Italy, breeding for show and companionship. Photographs, pedigrees, show news, and news about show dogs handled for others. In English and Italian. This all-breed AKC club in Olean, N.Y. hosts two conformation and obedience shows annually. The site contains information on upcoming shows, matches, club sponsored obedience, agility, handling & jr.handling classes, health tips, breed spotlight, photos and a fun page. Kennel history, handling information, and pictures. Castle Rock. Photographs of their dogs, professional handling service,grooming and handling videos available. Photographs, pedigrees, litter announcements, and handling information. France. [English and French]. Kennel history, breed handling tips, litter announcements, and photographs. Fortson, Georgia. Back care, manual handling and a no-lift approach for handling of patients. New South Wales, Australia. Calendar of events, list of annual shows and matches, dog show handling classes, public services, monthly meetings. Breeding for show, work, and as companions. Includes photographs, web design, all breed handling, stud service, puppies, and health testing. Located Calgary, Alberta. Kennel history, information on their professional handling services, news, breed information, and photographs. Sault Ste Marie, Ontario, Canada. Bird dog training and handling, started dogs, stud dogs, puppies, hunting and field trial handling and training, and boarding. Pictures, pedigrees, and breeding plans. Goodhue, Minnesota. COKC is an active dog training club located in Brandon, Manitoba Canada. We hold classes and events in handling, obedience, flyball, agility, and drill team. Brazilian show kennel with photographs and pedigrees of their dogs, also offers handling services and show photographs of dogs handled. Since 1964, Rusty Short has been breeding and professionally handling Akitas. Hers is a small kennel in So. California breeding for soundness, health and type. Health, and rescue information. Related links. Small breeding kennel in Dover, Florida. Kennel history and photos. A small kennel located in Delano specializing in blue and brindle dogs. Kennel information, photographs, and litter announcements. Texas-based kennel breeding all coats and most colors including imported English creams. Kennel history, litter announcements, and photographs. Small, selective kennel specializing in working German Shepherds and training. Kennel history, photographs, pedigrees, and Schutzhund links. Birmingham, Alabama. Kennel located in Sweden. Extensive photo gallery, Briard humor, information on the kennel and their dogs. English version available. gallery and performance and handling characteristics of the M3. Breeding and professional handling. Idaho. Dog photos with pedigrees, handling services, puppies and upcoming litters. About an Emperor Scorpions antics, living quarters, food, and handling. Pictures and information on upgrades for looks, handling, and performance. Australian Cattle dog breeders featuring available litters and handling services. Information, planning, tips, and insight on the handling and shipping of pets around the world. If the business hours of Mann Whippets in may vary on holidays like Valentine’s Day, Washington’s Birthday, St. Patrick’s Day, Easter, Easter eve and Mother’s day. We display standard opening hours and price ranges in our profile site. We recommend to check out mannwhippet.com for further information. 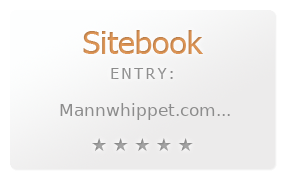 You can also search for Alternatives for mannwhippet.com on our Review Site Sitebook.org All trademarks are the property of their respective owners. If we should delete this entry, please send us a short E-Mail.